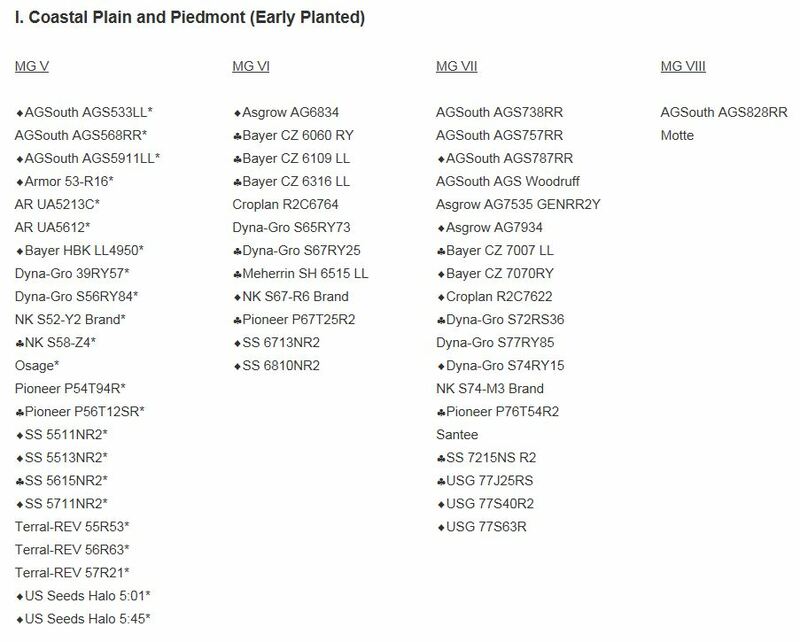 The to UGA Extension Agronomist Mark Freeman and UGA Extension Weed Scientist Dr. Eric Prostko, The following is the current list of UGA recommended soybean varieties for 2017. 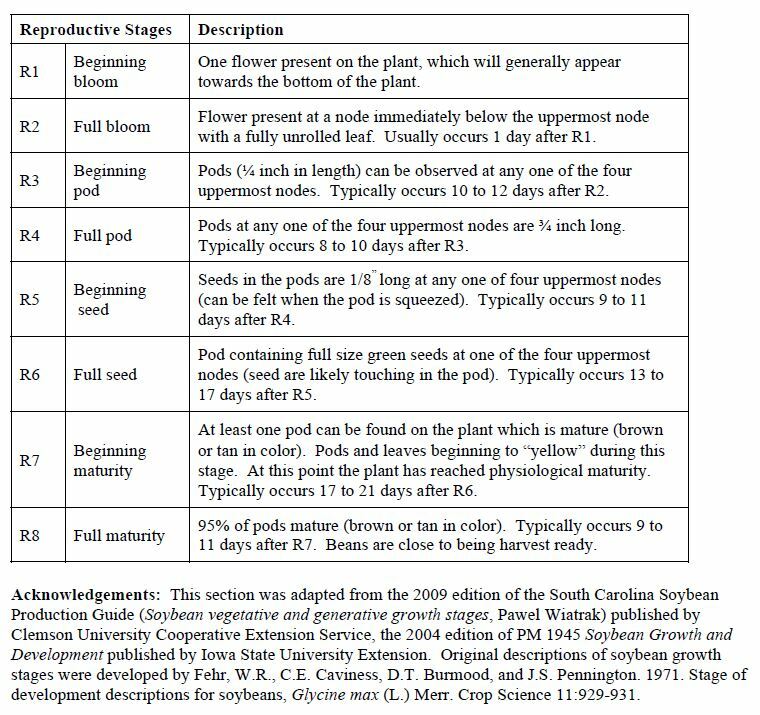 To make it on this list, a soybean variety must 1) perform, at least, at or above the 2-year average in yield across 6 Georgia locations (12-test average); 2) must not be susceptible to stem canker; and 3) other considerations include new herbicide tolerances or nematode resistances. 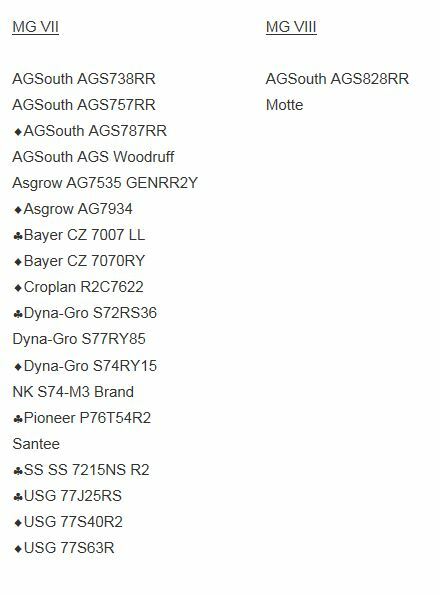 Cotton and soybean varieties with tolerance to auxin herbicides (2,4-D or dicamba) are being commercialized. Prior to making applications of dicamba to dicamba-tolerant cotton/soybean or 2,4-D to 2,4-D-tolerant cotton/soybeans in Georgia, growers will be required to attend the training “Using Pesticides Wisely”. The training will focus on helping applicators/growers make wise decisions when applying not only 2,4-D and dicamba but all pesticides. Growers are strongly encouraged to bring their applicators with them. Attendance is suggested for all on farm applicators to confirm that they have been provided the best management practices when applying all pesticides. Growers who attended 2015 or 2016 trainings, as long as they registered, are not required to attend the meeting again. However, they are welcome to attend as many times as they like. The trainings have resulted in 1499 Georgia growers completing the required training. A survey conducted of these trainings noted 99% of growers felt the training was worth their time and 98% of them believed the training would help them increase on-target pesticide applications. If you have questions concerning your registration, please contact your local county extension office. For growers who have not previously attended this training, options for 2017 are provided below. Select a time/location and RSVP, at least 2 days in advance, to the specific location for attendance. The required trainings will cover a 2 to 2.5 hr time period and will provide pesticide re-certification credits. Snacks and drinks will be provided (no meal). A few things to think about with regards to disease and nematode management in preparation for the 2017 field season. We are currently in a “weak” La Nina situation, “weak” because the equatorial waters of the cost of Ecuador are more than a half degree COOLER than normal. As best I can tell, the waters have been about 7/10 of a degree cooler which barely qualifies as a La Nina (as opposed to last year where we had a robust and sure-enough El Nino). So what does this mean? During La Nina years, the Southeast tends to (“tends to” means more often than not, but not always..) experience warmer and drier winters. Because we have a weak La Nina, this forecast could change. Pigweed seedhead in broccoli before Thanksgiving. 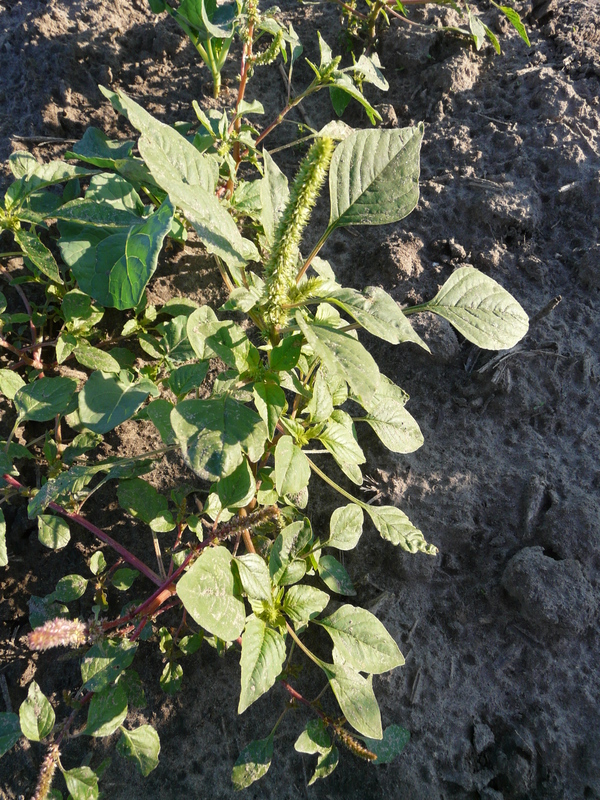 We are yet to have frost to knock back pigweed growth. How does our current “La Nina” impact our recommendations? Drier is not a good thing as it may mean we don’t fill up irrigation ponds for next year. It my mean we have a lot of trouble establishing cover crops this fall. Warmer temperatures may mean that kudzu, volunteer peanuts, corn, cotton-regrowth, etc. pathogens (like those that cause soybean rust and southern corn rust) may survive and increase longer than they would with an earlier “killing” frost. Also, as long as the crops and volunteers are active in the field, nematode populations can continue to increase and build. This will lead to larger populations for next season. Once the plants are killed, the nematodes can no longer feed. Once soil temps drop below 65F, the activity of the todes drops off as well. We may get some very cold weather soon, so we may not need to worry that much; however the general prediction is that we will have a warmer winter. The weather this winter will have some effect on TSWV and insects for next year. It remains to be seen what and how… but it will impact them. After afternoon showers and rain last week, we are really getting back to picking this week. Growers are also wide open on defoliating cotton. I saw some cotton being picked yesterday. I visited our buying points this week and looked at grades and other issues. Thankfully, we are not having many Seg 2 burrower bug hits as last year and the year before. Between both buying points, I only know of one known burrowing bug Seg 2. In every other Seg 2 case, they’ve turned around and cleaned them and they were fine. Grades are probably a little down this year compared to last, but are definitely not bad. Many good grades overall and low percentage of our sound splits and other kernels (pops). We could be pulling the trigger early on the some of the fields. Almost all growers are checking maturity twice in fields before digging, and many have checked more than two times. We’ve not seen maturity develop at a normal pace with our dryland peanuts which has made digging decisions tough. 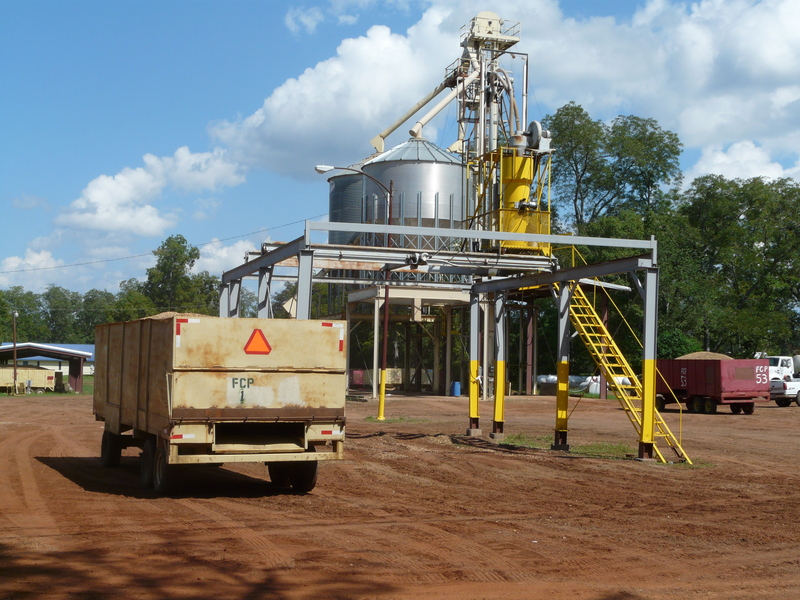 With more peanuts in the ground, growers are having to dig when they have help, or wagons are available, or weather permits. Vine condition is also a factor in our decision at this time. Overall, we’ve had good harvest conditions this week. 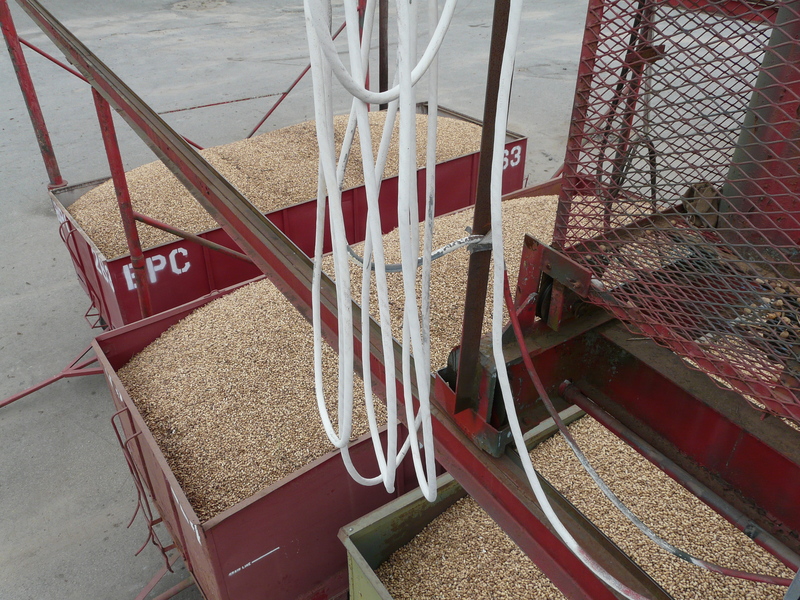 Even with afternoon storms or showers, sunny days have been able to dry peanuts quickly. Harvest is well under way by this time, but disease issues still affect peanuts that won’t be harvested for another three weeks or more. I have seen some fields where harvest is approaching and where white mold (stem rot) is still active, and I have recommended growers late in the season apply a mixture of tebuconazole and chlorothalonil to finish the season (both products have a 14-day preharvest interval). Other white mold products could also be applied (check preharvest interval first), but with time running out in the season, the value of tebuconazole is certainly a consideration. 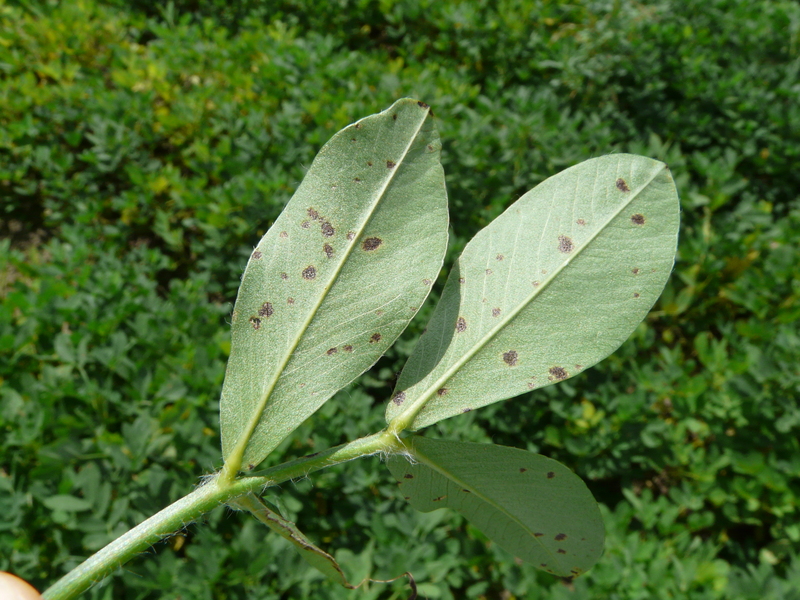 I have also observed where leaf spot, especially late leaf spot, is aggressive late in the season, primarily on a susceptible variety like ‘Georgia-13M’. If less than two weeks to go before digging, it is doubtful anything should be applied (or legally can be applied). If peanuts are 30 days or more away from harvest, then the grower can mix a pint of chlorothalonil with 5.5 fl oz/A of Alto. If harvest is more than 14 days away from harvest, the grower can mix 5-10 fl oz/A Topsin with a pint of chlorothalonil. Fields where defoliation from leaf spot diseases has reached 50% or more and have not yet reached the optimal digging date should be considered for an early digging. Soybean producers in southern Georgia have experienced losses to Asian soybean rust this year; however it appears that most have successfully protected their crop with judicious fungicide applications. MORE IMPORTANTLY, I have observed a SIGNIFICANT amount of frogeye leaf spot (Cercpospora sojina) disease in a number of fields this year; something I have not seen in many years. I am not sure why this is so; however it is something we will need to watch again next season as well. Additionally, I am seeing pre-mature defoliation to Cercospora blight (Cercospora kikuchii) in a number of fields; this disease often results in purple stain of the soybean seed. Cercospora blight is diagnosed, in part, by the prominent loss of leaves in the top of the plant leaving only the petioles, reaching like bony fingers to the sky. Bacterial blight (Xanthomonas citrii pv malvacearum) continues to cause concern to many growers in the state. From your reports, reports from our consultants, and from my own observations, it is clear that bacterial blight can be found in a number of fields across the Coastal Plain. 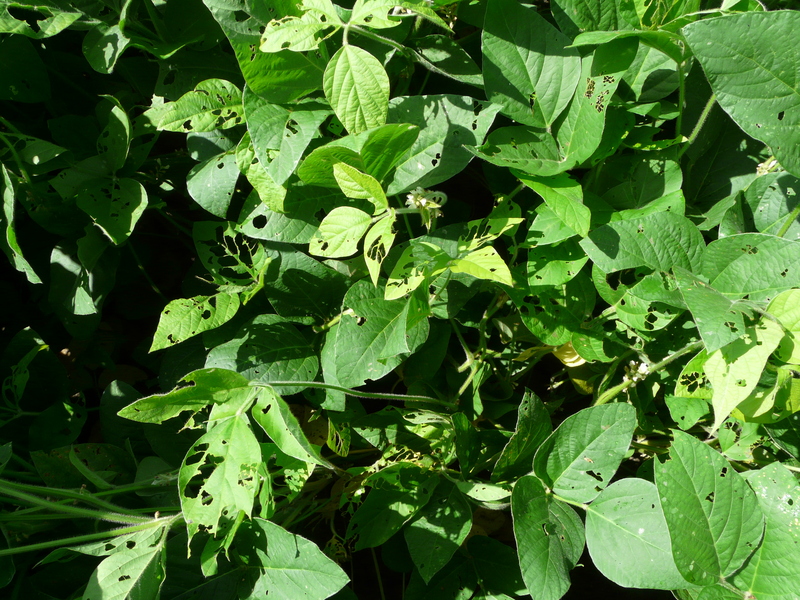 Classic symptoms or bacterial blight on leaves, bracts, bolls, stems and petioles are fairly easy to diagnose; still symptoms of other diseases may inadvertently be diagnosed as “bacterial blight”. It is my belief, based upon my observations and discussions with a number of experienced individuals, that losses to this disease are likely to be small and even negligible in many fields. Finding a little bit of disease in a field is an important contribution to understanding the occurrence of bacterial blight in 2016; but incidence alone does not mean significant yield loss. Certainly there are some fields, especially in extreme SW Georgia, were boll rots appear to be closely associated with bacterial blight and losses are likely to occur. Effective management of bacterial blight by a grower revolves around variety selection (we are composing such a list for Georgia cotton producers now) and management of crop debris/residue as the pathogen can overwinter in such. Crop rotation and burying of crop debris can help to minimize the development and spread of the disease in upcoming seasons. 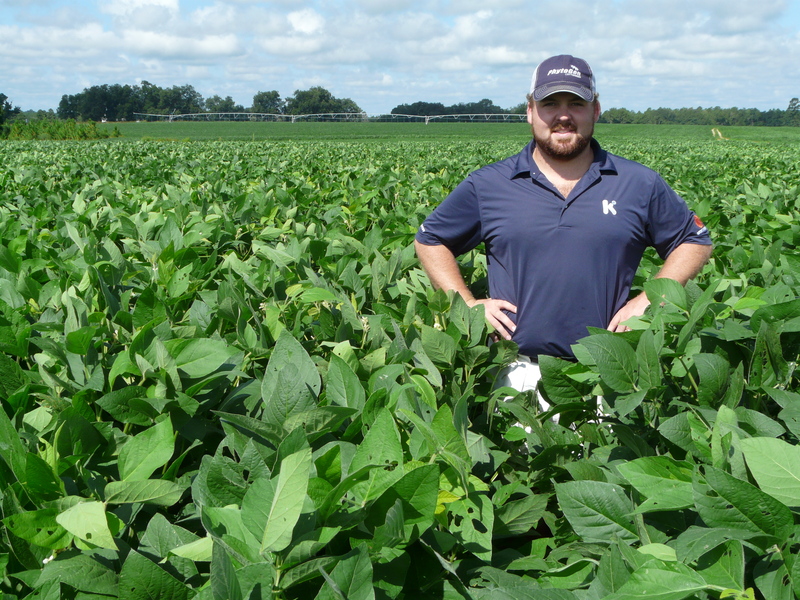 Here is a look at some of Brandon Barnes’s ultra-late soybeans that are looking very good. This is Pioneer 95Y70s, planted behind sweet corn on June 20th. Ultra-late soybeans can be risky, but something to consider for income and our environment. Planting date is probably biggest issue.Traditional research has shown that we lose 0.75 bushel/acre when planting mid June to July. UGA Agronomist Dr. Jared Whitaker says initial work in the ultra-late system is losses planting goes into August, the best educational guess as to cutoff date is first week of August. Dr. Whitaker also likes narrow rows. This row spacing is set at 20 inches. We need to also have 175K – 200K seed population. Brandon planted at 200K seed population. A little nitrogen in this system doesn’t hurt either. Though soybeans don’t need supplemental nitrogen if properly inoculated, the window for growth in this system likely takes away ability to produce enough N.
We definitely need irrigation in this system. Brandon is now putting out close to 2 inches of water per week as soybeans are entering the reproductive growth stage. Once flowering occurs, we are in reproductive growth stage. The plant will go from R1 to R8. 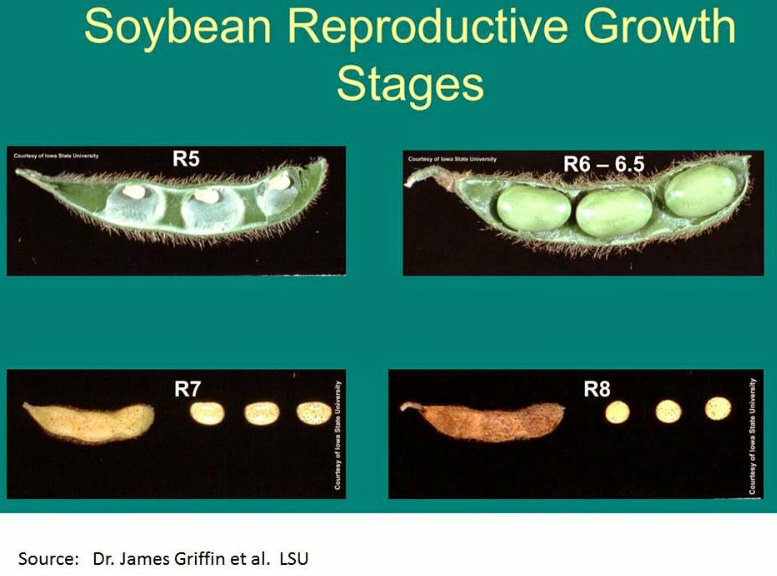 Below is a chart on growth stages. These are important when we look at pests. Asian soybean rust has been found in the county on Kudzu. They’ve already treated with fungicide on this field. We are not considered safe from ASR until we get to R6 growth stage (seeds are touching in the pod). Once we hit reproductive growth, our insect thresholds change. They’ve treated for caterpillars already, but we noticed lots of leaf damage still. We can have 30% defoliation before bloom. After bloom our threshold is down to 15%. We also want to check caterpillars since soybean loopers have pyrethroid resistance. Brandon and I found some soybean loopers, but no green cloverworms or velvetbean caterpillars. UGA Entomologist Dr. Phillip Roberts says green cloverworms are rarely at high enough levels to treat. They usually appear early and serve as host for insect parasites and predators. This is also a critical time in corn development where we don’t want stress on the plants. 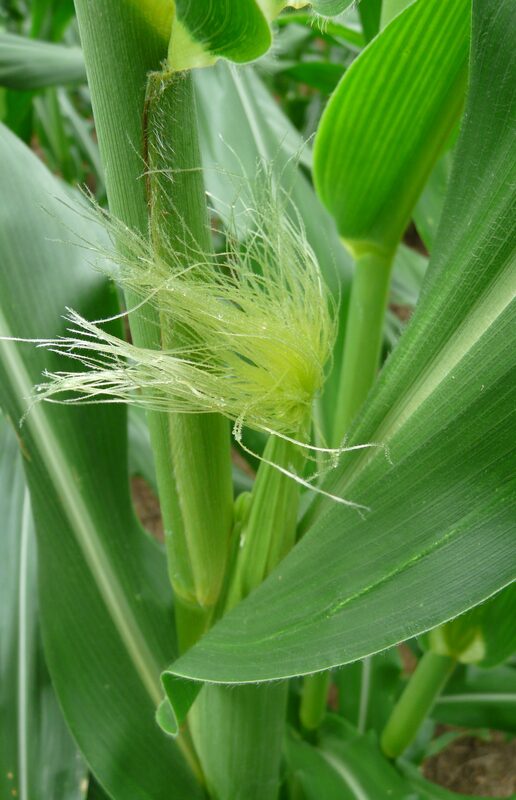 Stress during silking can reduce the number of kernel per ear. The number or rows will not be affected now as they were decided already. 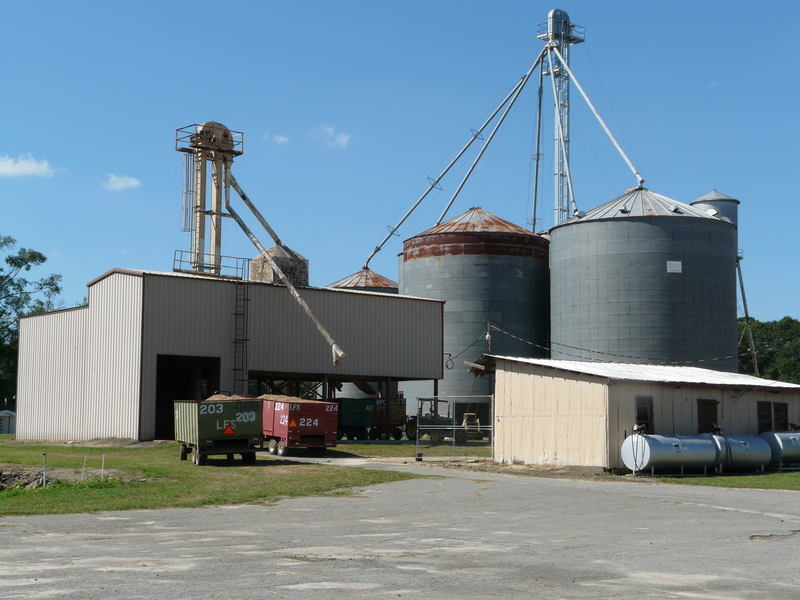 Disease is the main topic this week with corn, and here is an update from UGA Extension Pathologist Dr. Bob Kemerait on disease in CORN and SOYBEANS. Our scouts have found Asian soybean rust on kudzu in Miller County today (May 17th). This is the earliest we have found it since 2005, and it likely means rust will be problematic for our soybean producers this year. 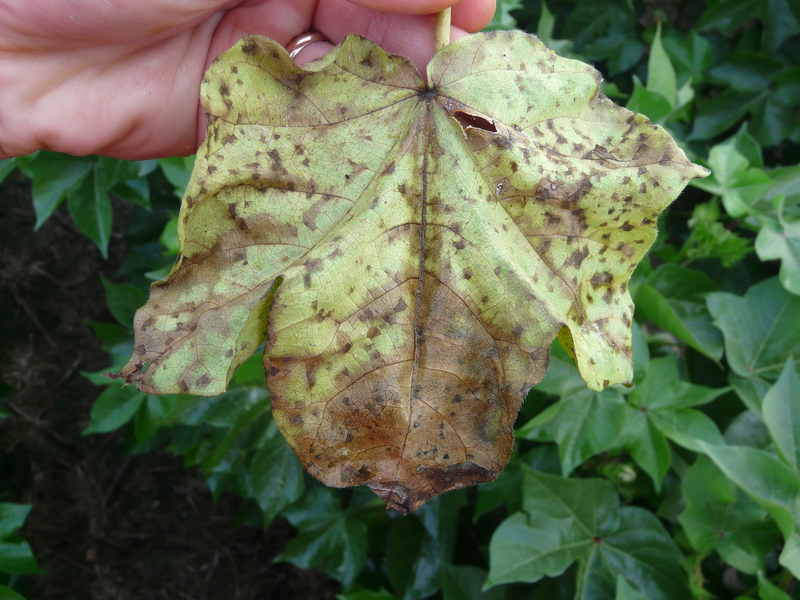 Current conditions favor spread of the disease within kudzu. 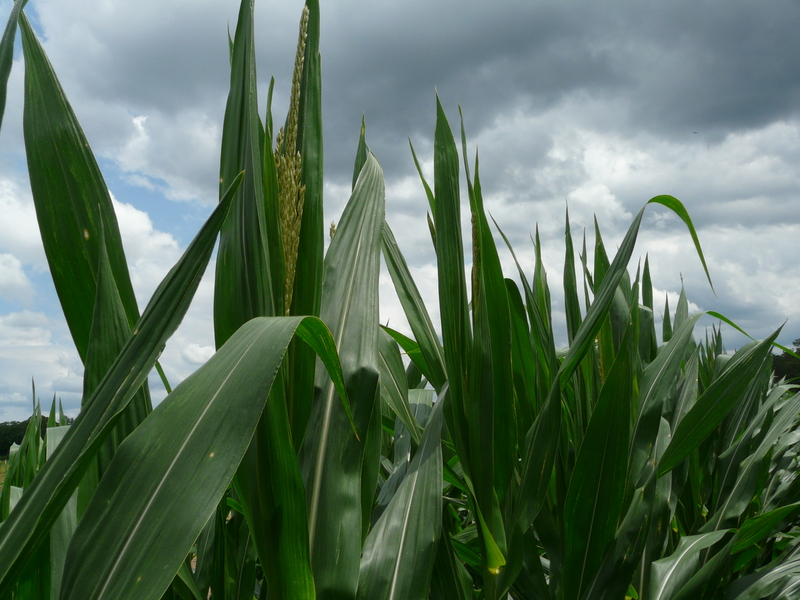 Tassel stage (or just prior to tassel) is an appropriate time to consider applying a protective fungicide. This is especially true if a) southern corn rust has been detected in the area, b) northern corn leaf BLIGHT is problematic in a field (typically with a less-resistant hybrid), c) conditions have been favorable for disease (very wet), d) the corn was planted LATE or e) the grower is aggressive in a disease management program and wants to make sure the crop is protected. As of today (May 17th), we have not found SOUTHERN CORN RUST in Georgia and conditions have not been especially favorable for southern rust. 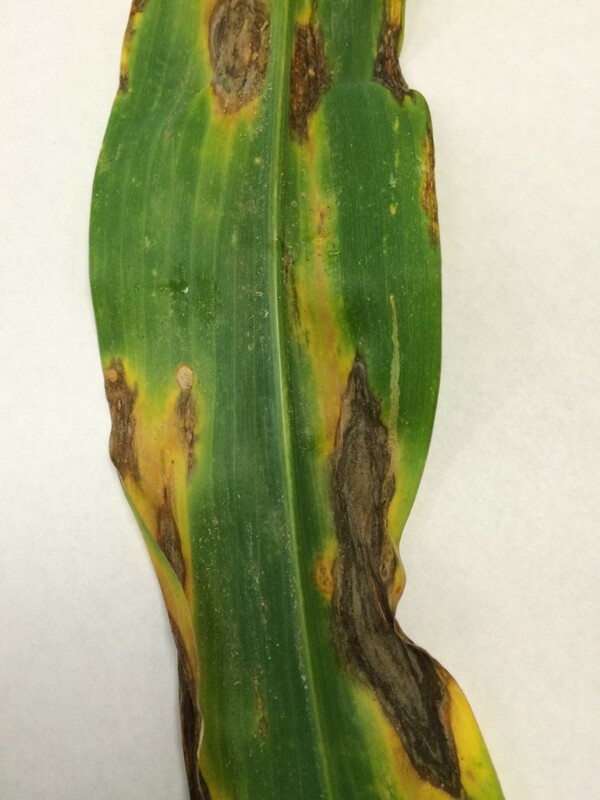 As of today, we have had one report of common corn rust from Mitchell County. 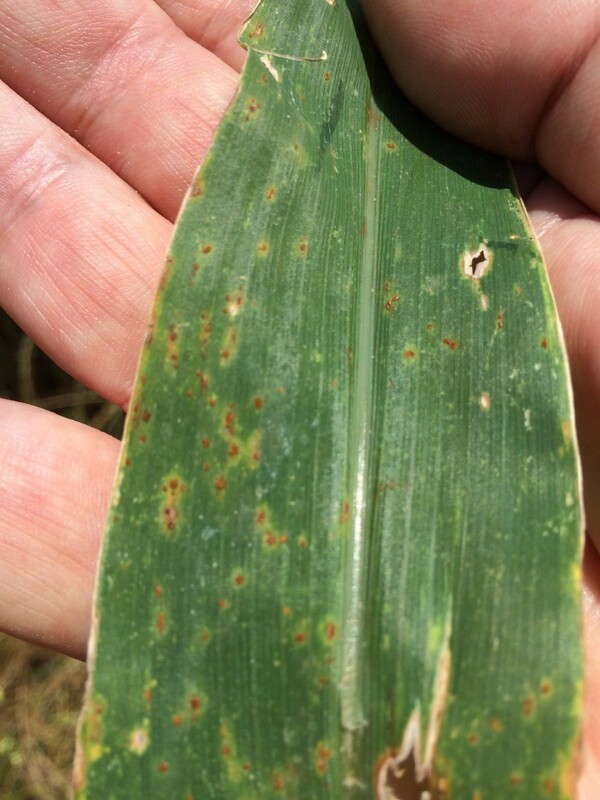 Common rust typically forms pustules on both sides of the leaf and does NOT need a fungicide application. As of today, I have only had a report of northern corn leaf BLIGHT from Ty Torrance in Decatur County. Northern corn leaf blight can be an important problem that requires a fungicide treatment IF it is severe (e.g., a susceptible variety and favorable weather). The NCLB in Decatur County was confined to the bottom leaves and there were only a few lesions on about one plant out of 15. The grower is right to be aware of the problem but I do not think a fungicide is needed for NCLB in that particular field. 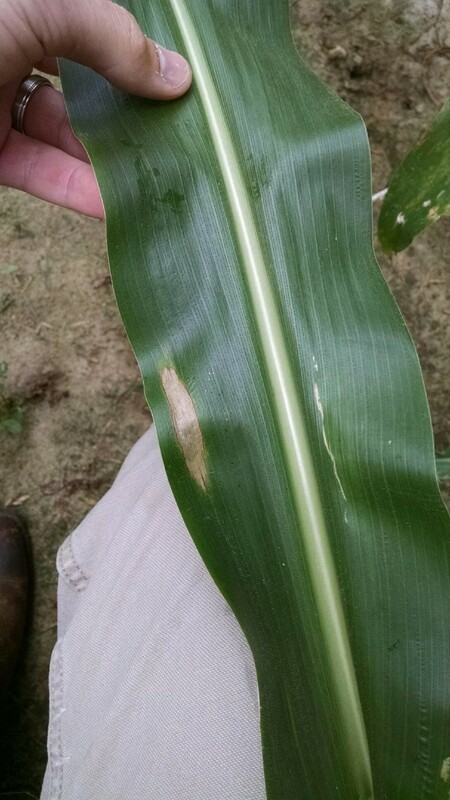 Northern corn leaf SPOT has been found in Mitchell County by Andy Shirley. Typically we do not spray for this disease, except in severe cases. The northern corn leaf spot in this field was confined to the lower leaves and did not appear to be spreading. CORN: We have not detected southern corn rust in Georgia yet. Conditions over the next few days are more favorable for disease spread, but (overall) conditions have been unfavorable. I would not argue with a grower who wants to apply a fungicide at this time (to corn) as it reaches the tasseling growth stage; HOWEVER I think the grower is better advised to DELAY a fungicide application at this point and wait at least a week or so.